I wanted to utilise the mango season completely and no mango recipe collection is complete with a mango cake…Agree?! 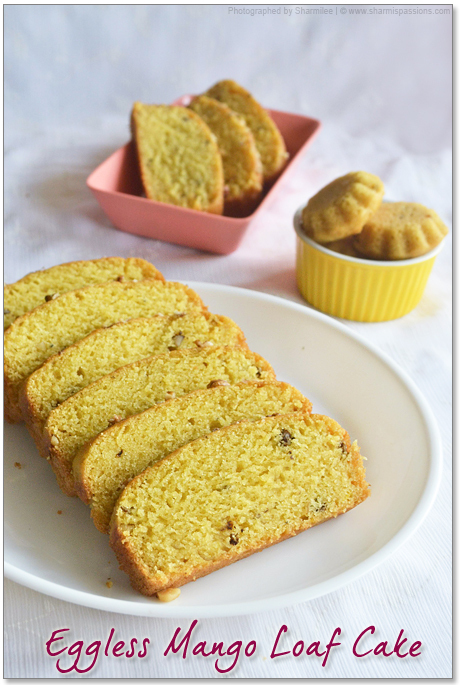 I have seen mango cakes, muffins and bread in so many blogs and when I wanted to try I went ahead searching for them. The one that suited my constraints(Yes I wanted a low fat version) was the mango banana bread from litebite. 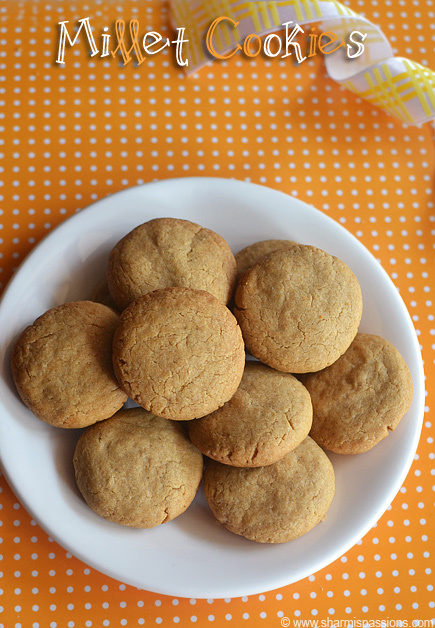 I am always amazed by her low fat baking goodies that I went ahead to try this with few modifications to suit my taste and it turned out super good. Chop the mangoes and puree it without water to get a thick pulp. Keep aside. Sift maida, baking soda, baking powder and salt atleast twice for even spread of baking powder and soda.Now add rava to the maida mixture, keep aside. 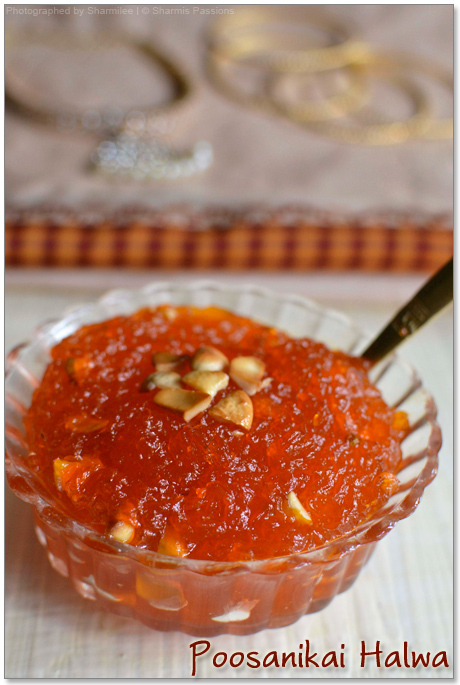 In a seperate bowl, add oil,yogurt, mango pulp, cardamom powder,sugar and mix well till sugar is completely dissolved. Now add the curd mango mixture to rava maida mixture slowly and mix until a thick batter is formed. Add chopped walnuts and mix once. Reserve 1 tbsp of walnuts for topping. Preheat the oven at 190 deg C for 10mins. Meanwhile grease the pan with little oil and sprinkle maida. Arrange butter paper if you use it(I use for most of the cake for easy unmoulding). Transfer the batter to the cake pan. Top the cake batter with remaining chopped walnuts and bake it for 35-40mins at 190 degree C.In my OTG it took exactly 40mins for the mango bread to get baked. The top would have turned to a golden brown color by this time. Check with a toothpick in the center of the cake and if it comes out clean then ur cake is done.Cool it for atleast 15mins before you unmould and slice them. 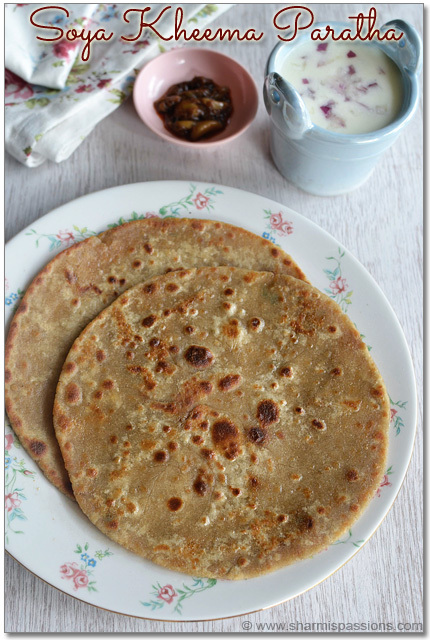 I dont miss to use a butter paper these days as its mess free to unmould and cleaning the pan is also easy. For the tart mould I didnt even grease but still unmoulding was super easy. I used a bread loaf pan and 3 small tart moulds.You can use a normal cake pan but see to it that the pan is as big as to hold the batter only to 1/2 or slightly more than the pan . The baking time totally depends on the cake mould and the oven, usually my bread loaf pan takes a little longer so it took me 40mins. So keep an eye after 30mins and then extend baking time accordingly. The cake in the tart moulds were done in 20mins. Only the bread loaf pan took 40mins to complete.So if you are planning for muffins it will take just 20-30mins. Adding sooji gives a wonderful texture to the cake. 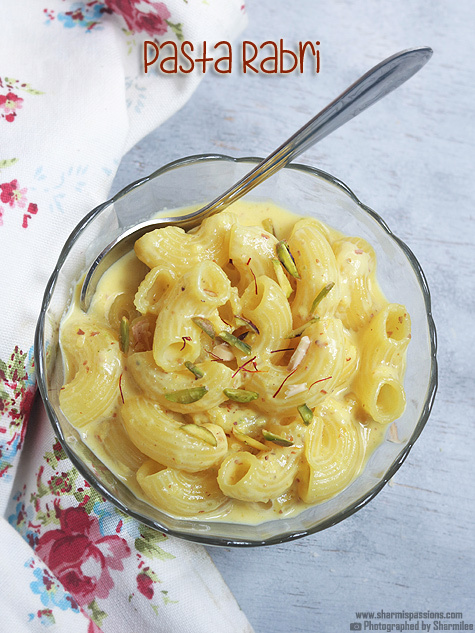 Mango and cardamom combination is heavenly so dont skip it. The orginal recipe calls for only 1/2 cup sugar but I felt my mangoes were not that sweet so I used 3/4 cup and it was perfect. As the cake uses mango pulp, it keep well only for 2 days. Dont refrigerate the cake, as it would become hard. Mango, curd and rava gives a wonderful texture to the cake/bread that the cake came out beyond my expectation that everyone loved it at home. The nutty crunch in every bite tasted out of the world…yummmy. The mango bread looked so lovely that my camera didnt stop clicking at all 🙂 The smell of the mango cake while it was baking was too gud that I cudnt move out of the kitchen. Usually I like cutting cakes into pieces and when it comes to slicing breads I just luv them and this cakes texture was just perfect to make slices. Trust me and go ahead to try this cake. Eggless mango cake looks delicious. yay! mango cake and that too eggless. I am so making this soon. thanks to you and litebite. Lovely pictures, S.
Loved it!!! Super delicious looking. I loved the color of it. I am going to try with the pulp we get here. Loved the texture and colour.. Delicious and lovely clicks as always!! Lovely Clicks sharmi, esp choc sauce flowing out! cake has turned out so perfect! You are the Master Baker! Wow. the cake is very beautiful. Bookmarked. Wow…wonderful cake..gorgeous colour and what a great texture. loved the clicks, the cake and its texture. Truly a tempting one. I just made a eggless mango cake with butter last nite. I still have some puree left and i shall try this today.Since it is already eggless i need not worry about egg substitutes. Lovely texture of the cake and pretty neat slices!! wow! Cake looks super delicious, soft and yummy! Nice recipe…will definitely try this. Thanks for sharing. What a yummy and moist bread .. thx dear. Wat an elegant, absolutely stunning super soft cake, yumm! Absolutely yummy looking..n its so soft..
How lovely the cake look, wonderful colour and prefect texture! Like the rawa in the cake..will give a good texture fr sure. And walnuts..Mmm..wish I could come to your home and have a bite of this gorgeous cake. Thanks Sharmilee for trying out from Lite Bite. Feel honored and good since it is coming from a seasoned cook and lovely food blogger like you 🙂 Tight hugs and best wishes. Mango Cake looks awesome…Nice texture….Mmmmm very inviting. Honestly, I've never tried any cakes/muffins with mangoes….but I can just imagine how good it must be. Love any recipe with mangoes and your bread sounds like the perfect recipe I should be trying before the end of the mango season. I heart Alphonsos. Ohh your pictures look absolutely GORGEOUS….shows the beauty and texture of the bread brilliantly! Cake has risen perfectly:-) Loved that little cute beauties !! Wow…wonderful cake..gorgeous color and what a great texture. Wow, loved your mango cake..
Yum, beautiful color, looks superb !!! Looks so so soft and delicious and love the pic with teh sauce too. that looks delicious.. I think I should give a try soon..
yummy cake..love the colour..so soft n delicious..cant take eyes off the pics..awesome pics as always..
Nostalgic recipe.love the clicks as usual.So soft and smooth. Loved the beautiful golden yellow color ~ a stunning cake! Gorgeous!! Yummy looking cake & great pics Sharmi! 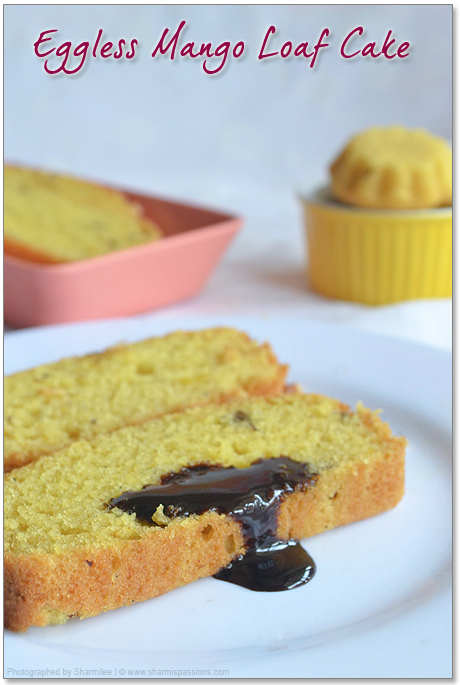 I have some mango puree frozen for a rainy day (literally)- am going to try this cake soon! wow..looks so tempting..awesome presentation and wonderful clicks.. Wonderful eggless cake. Amazing clicks and lovely presentation. Really tempting and drooling. What a coincidence, even I had baked mango bread in my last post. Great to see an eggles version of the bread. Excellent pics. Oh that little cupcakes one are so cute and bread is great! This looks delicious. I am planning to use store bought mango pulp. Can you give the measurement of mango pulp in cups? your blog is wonderful!! i love your clicks!!! they impressed me a lot!! !yummy recipes all over!!! i'm happy follower of your blog!! !plz visit my blog when time permits!! Recipe looks very delicious. Just a small info needed. Can I use the Upma variety rava here? Because the one which I see as fine variety rava is almost like flour. So please give your suggestion here. @Anonymous : Yes you can use the one used for upma but the white variety…. mmm this sounds so delicious, i adore mango but have never had mango bread. About time this was changed i think! Hai..I tried this Mango cake as cup cake and it came out well…But, only one problem…i find the texture of sooji in the cake…I used the idli rava…should I soak the rava in water for some time?? 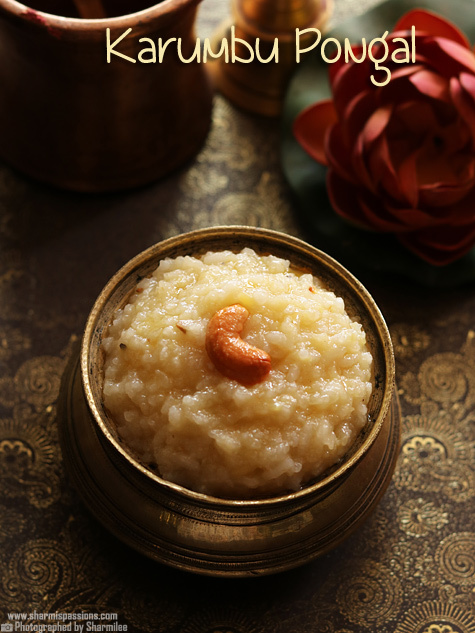 @Tamilmuhil : Thanks for trying and letting me know the feedback.It is the fine variety we used for kesari and upma but if you dont like the texture of rava then go ahead with full maida. No need to soak in water. This recipe is so good…n’ the snaps look so gorgeous…i recently made some mango cake…really liked that too…will try this the next time arnd. This recipe looks beautiful. I will try it when mangoes are back in circulation, surely. I was wondering, after the success with your other recipes, if you had a good sandwich bread recipe on your blog. But found only this. If you do make white/brown bread yourself, could you add it to your blog? Since i gave up my bread machine I haven't found the right recipe at all. hello, great recipe..some questions…can we use one cup of mango pulp instead of one mango?and can we use half cup of maida instead of using half a cup of fine sooji.how do the texture and tastes differs using half cup sooji and not using only plain flour for the recipe.which tastes better?using only plain flour or using 1 cup plain flour and half a cup of sooji….pls do answer .i want to try this great recipe soon. @Anonymous : Yes you can replace mango with mango pulp but the quantity depends on the batter thickness(3/4 cup – 1 cup should do fine). Am not sure of how to explain the texture of the cake with sooji…but we liked it that way also the orginal recipe suggested it. You can try with full maida first if you are skeptical about the texture when sooji is added.Hope this helps! 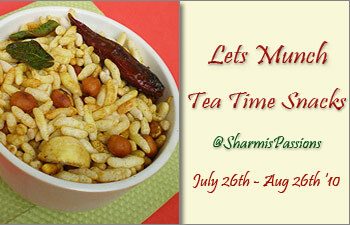 Wonderful blog and healthy recipes.Thanks sharmi. hello i jus tried ur mango cake receipe..but i hd a problem,…intially the cake rose well but when i removed it from oven it kind of settled back n became hard..dnt knw what went wrong..hope u cld help me. @Swati : Oh..I'm not sure why it sinked, may be becos of the rising agent inactiveness? However i didnt add sooji.. replaced it with maida itself..
Just one question to ask..
120 140 160 and so on..many a times the cake calls for a baking time of 190 deg or so..
how to adjust the baking time and temp to get the same effect?? @Archana : That is great to know! My oven also has odd multiples and just adjust to intermediate and keep when it calls for 190, etc. @Geethu: Np at all 🙂 Yes eggs give a great texture and fluffiness to the cake but I dont find major issues with eggless bakes too… But sorry I am not sure of converting an eggless version to a version with eggs. I just try from the orginal recipe with very minor modification. K got it…..thanks for the reply…. Sharmi,i tried it yesterday,instead of olive oil i added normal sunflower oil….but it was so hard ,i think it shld b due to tat rava(i used upma rava)!! !i used the exact measure u mentioned for all the ingredients but it didnt come out well 🙁 feeling sad!! @Geethu : Oh I am really not sure what went wrong…I used the fine rava variety too. Sorry to hear that. Hi Sharmi,I made this cake yesterday.it came out pretty well except for two things: 1) the texture was lil moist. 2)the flavor of rava, I felt was raw.so r v supposed to roast it before adding it to d cake mixture? No I didnt roast rava, not sure why you felt the raw taste….May be if you dont like rava taste, then may be you can skip it and try fully maida cake. I tried this cake yesterday. Inside, the cake was moist, bread like…. But the crust – both top and bottom tasted too much like crispy rawa… and inspite of the mango being overly sweet, I used 3/4 cup sugar coz I read your notes below the recipe after I made the cake… lol… still the cake was not at all sweet… The next time, if I increase teh sugar quantity to 1 cup, should I also increase the liquid ingredients? The sweetness purely depends on ur mango, taste it and then adjust sugar level accordingly.Just increase sugar level no need to increase other ingredients. 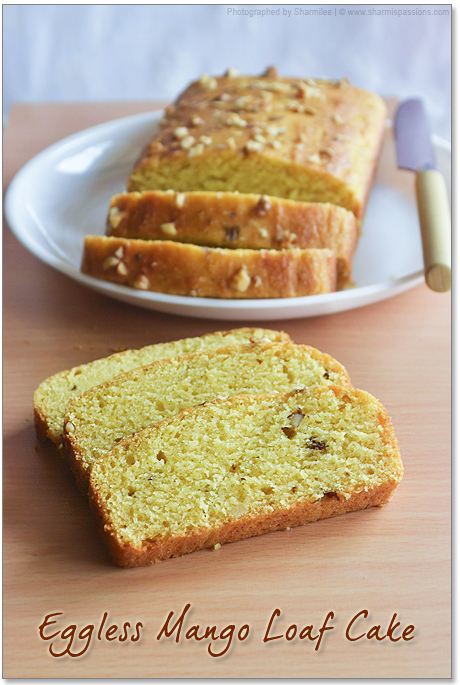 I tried this cake today.It came out superb…..Thanks for the recipe……I used almonds instead of walnuts. It tasted good……. 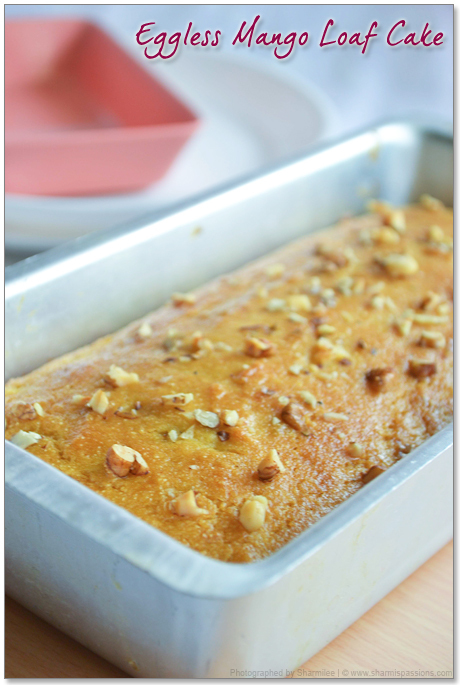 made this cake today…really wonderful recipe….used cashewnuts instead of walnuts….. Tried it out over the weekend. came out well. Initially we could find the taste of batter – but after a day, it had the texture of the bread. 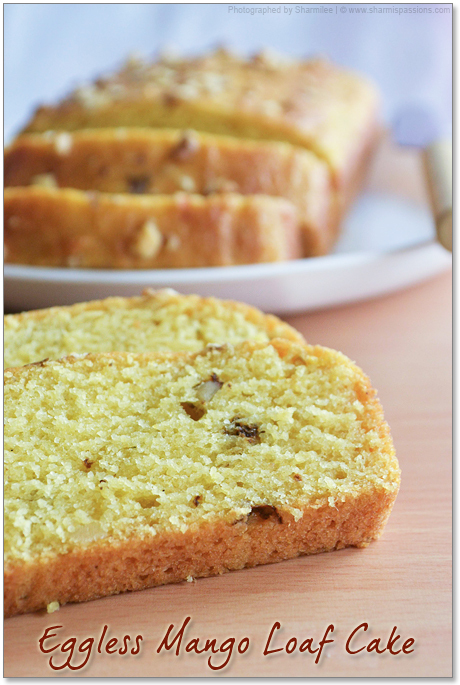 Hi sharmi….can we use white bread flour instead of maida…..
Hi sharmi, i too tried this cake yesterday, i tried this in cooker as i don't have oven at my home, cake became little hard and the bottom of the cake was little burnt, though i used butter paper in greased vessel, but taste was good. I am trying it today! I am purchased Morphy Richards 18 liters 1 week ago, & i am making ur recipe banana muffins then cake… But both recipes burn in 10 min.. Why? pls help mi… tell mi temprecher setting..
Oh not really sure….please check your manual for preheating details and working before you start baking….I am sure that will help! Sharmi, May i Please know which variety of mango you used? Can we use readymade mango pulp? Nowadays i m living in US …so not sure about mangoes.. The cake looks yum! Eager to try it. Can you please tell me how much (in cup) Mango puree did you add to the recipe? Also, did you use Chiroti Rava? Hello, your recipe is awesome,thanks for it! my cake came out perfect except one thing: it came out much stickier than yours.I've baked more 10 minutes for this reason, but its all same. 🙁 what may have gone wrong? Not really sure why it became stickier, Was the batter consistency correct?! I just followed the orginal recipe as such…. Hello sharmi mam I follow ur site and make some dishes came out really well looking forward to try many more dishes too…so in this receipe can I replace olive oil with butter.if thn I can how much of butter I can use. Use the same 2 tbsp….. I bake in a microwave oven in convection mode and I realised that cake in the form of bread either in a glass or metal tray does not cook properly in the centre and hence the top gets crispy. What changes should I make in the temperature and timing? Can i replace mango with pumpkin puree? Hi Sharmi I tried mango cake. I love mango and also you are my favourite. But today the cake came out sticky and could not use it. I sometimes face this problems it tastes good. But it is sticky which sticks in teeth. Can you tell me why is this happened to me. Hi your eggless mango cake turned out very superb and your explanation is tempting very much to try this out soon.nice clicks and thank you for your wonderful post. hi… The cake turned out so good. Thanks much for the yummy recipe.